Nimbo Fork is nestled between Gundagai and Tumut in the NSW hinterland. Winter tends to bring out the lazy, sloth-like hibernator in all of us. When going out seems like twice as much effort, and staying home in bed with a good movie (and greater company) is at least five times more appealing. Nimbo Fork offers guests six private cottages and six lodge suites to choose from. For the ultimate in secluded getaways, Nimbo Fork Lodge offers the perfect setting for couples looking to unwind together and escape the daily grind. 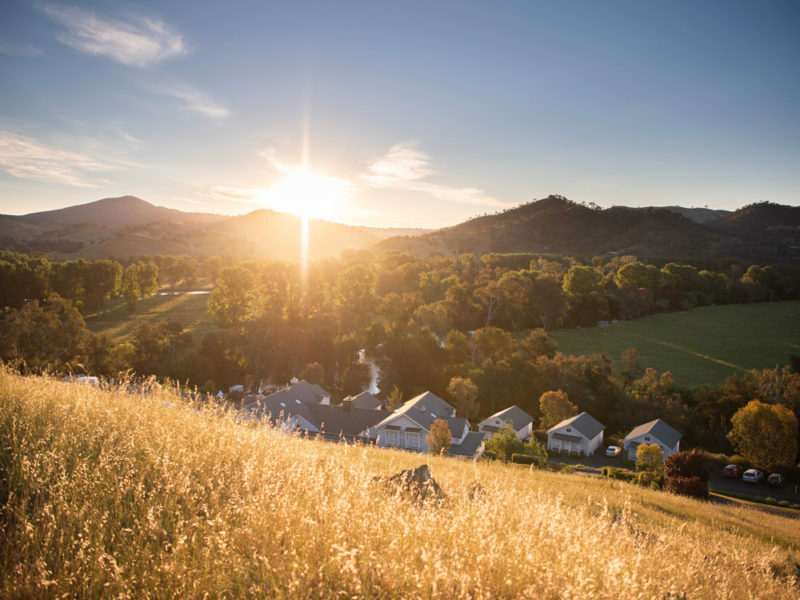 Nestled in the NSW hinterland, overlooking the Tumut River at the foothills of the Snowy Mountains, you’ll find Nimbo Fork’s six private cottages and six lodge suites. Inspired by their surrounds, each cottage and suite are named after local landmarks and with unique design elements, reflect their own distinct personality. For guests with reduced mobility, the Geehi Cottage features a wheelchair ramp, grab rails, accessible ensuite facilities and a lowered queen bed. Keep cosy beside the fireplace at Nimbo Fork Lodge. The Nimbo Fork fine dining restaurant is open for gourmet breakfasts, homemade hampers for lunch and dinner, and serves up Australian modern cuisine for dinner. Nimbo Fork combines a Hampton’s style aesthetic with unexpected luxury. Guests can watch horses grazing in the paddocks from their private balcony, relax in their own deluxe bath with panoramic outback views or rejuvenate with an in-room spa treatment. If you’re looking to take the activity level up a notch, there are many walking and bike trails leading off from the property to be explored. Pack a picnic to take with you and spend the afternoon by the edge of the river, listening to the water rush by. If you’re wanting to explore the surrounding areas, spend the afternoon flying over the Snowy Mountains with True North Helicopters, followed by a visit to local wineries Obsession and Courabyra Wines. This is luxury and remoteness in the most literal sense of the combined description. With just 21 rooms, Southern Ocean lodge took 10 years to create and it’s no wonder. Perched delicately atop the cliff face of South Australia’s Kangaroo Island, these luxury lodges feel romantic and secluded, despite the fact that you’re situated alongside the lodge’s other rooms. The floor-to-ceiling glass panels allow you to bathe in front of the vast Southern Ocean and take in one of the most spectacular views the world has to offer in absolutely privacy (thanks to the side-by-side nature of the lodges). The lodge’s food philosophy of ‘produce to plate’ means that you’ll be inclined to make the walk from room to restaurant, just to treat yourself – three times daily. Prices start at $1200 per person per night. Stay at Sanctuary by Sirromet, Queensland’s first vineyard glamping accommodation experience. Located 30 minutes from Brisbane, half way to the Gold Coast, picturesque Mount Cotton houses a well-known vineyard called Sirromet. Just recently, glamping tents were added to its offerings, with over $10 million invested on the first 18 sites made available to the public. Sanctuary by Sirromet is Queensland’s first vineyard glamping accommodation experience. The safari-style satin-lined tents are nestled on the vineyard’s acreage and feature floating balconies that look over the lagoon and accompanying native wildlife. The balcony is the perfect spot to share a breakfast hamper or watch the sun go down with a glass of wine. The tents are also ‘TV-free’, to encourage guests to connect with the tranquil surroundings. If you’re keen to connect with other human life, guests can choose to dine at any of the three on-site venues at Sirromet, they’re only a five-minute walk or short mini-cart ride away from your luxury tented home. Prices start from $280 per night and include a naturally sourced breakfast hamper. Ever wanted your own island to yourself with your lover? Tasmania’s Satellite Island makes it a reality – and it could be the best darn days of your life. Firstly you get the entire 34-hectae island to yourself. Seriously. And secondly, it’s not even as expensive as you might think. Plus, for the price you pay per night, you get gourmet breakfast, a stocked pantry, an endless supply of wild oysters (seriously) and any equipment you may need during your stay, including kayaks, snorkels, yoga mats and stand-up paddle boards. Your boat transfers are also included. Oh – and the island sleeps a maximum of eight people – so if you’re willing to share the island with some friends, you’ll also share some of the cost. Prices start at $1800 a night for two guests with a two night minimum stay. This price is all inclusive. Situated almost six hours from the Sydney CBD, this rarely visited gem is absolutely made for the explorers keen to unwrap the next must-visit destination, out of the spotlight, before the rest of the travellers cotton on. The totally self-contained luxury safari tents rest on a deck made with timber milled by the owners of the property, and is filled with a beautiful queen-size bed, a full kitchen and barbecue, an indulgent modern bathroom and (thankfully) a heater during the cooler months. The beauty of this place is the serenity – and that during the day couples have the choice of mountain biking, relaxing, or shopping for fresh-as-they-come oysters grown in Wapengo lake, and enjoying them with a glass of wine as the sun goes down from the deck of your luxury tent. Prices start from $215 per night, depending on season. If what you seek when you head away for a break is something different to what you experience every day, then these luxury glamping tents are the ultimate destination. Situated just 10 minutes from Bendigo City Centre and two hours from Melbourne CBD, Balgownie winery’s bell tents provide an opulent getaway option among nature. You can also choose the bed and breakfast glamping offer, which includes breakfast in the winery’s signature restaurant. Prices start at $109 per night for two guests in a bell tent. $145 for two people for the bed and breakfast option. Located just 75 minutes from Melbourne, the natural hot springs in Victoria’s Mornington Peninsula are heated by the Earth’s core, 60 metres below, and then pumped up to the surface and filtered into the pools. If the outdoor pools aren’t grabbing you, then perhaps the reflexology-focused pebble pool will intrigue you, or the Moroccan steam room? Oh, I bet it’s the cave pool that’ll pull you in, especially at twilight. But if it’s complete privacy that you seek on your escape away, then you’ll probably be all for the Spa Dreaming Centre for couples and the pampering that comes with it, combined with private baths that overlook the glorious natural surrounds. Prices start $75 per person for private bathing (45 minutes). The stunning pool at Bannisters Mollymook. The great thing about Bannisters by the Sea is the fact that it can cater to the kind of getaway you seek – and to your budget. The 34 newly refurbished rooms are comprised of luxury suites, more laid-back spa retreats and penthouses, you know, if you’re after a more ‘whole home’ feel. But location is the star here: uninterrupted ocean views, the sound of the waves your own personal lullaby, and a personal balcony for each guest makes this place just magical – even in the depths of winter. Prices change depending on season, but can start as low as $250 per double per night for a pavilion room and includes a continental breakfast. And, specially for winter, check out the Ten Degrees Warmer package, which includes two nights’ accommodation, $50 credit to spend at Rick Stein, $20 credit per person towards treatments from Bannister’s Day Spa couple’s menu, and more. Situated high in the rainforest canopy, the Lagoon Bayans of Daintree Ecolodge provide the privacy many couples seek. There’s something about being right in the middle of the rainforest, the sounds of nature surrounding you, that’s just so peaceful. The perfect base for exploring the Daintree during the day, there’s no better place to snuggle up and rest your tired legs of an evening than in your private rainforest hideaway. The Rainforest Bayans feature spectacular freestanding baths within an enclosed balcony, providing you with an uninterrupted rainforest view that’ll envelop you as you bathe; while the higher level Canopy Bayans will see you nestled in the treetops. Prices from $345 per couple per night for the Lagoon Bayan. Empire Retreat and Spa a luxury hideaway, for grown-ups seeking solitude… together. An adults-only destination that evokes relaxation and style with just the level of detail included in each luxury suite. Subdued lighting and natural stone and timbers work together to create a peaceful, quiet atmosphere for couples to unwind and enjoy each other’s company. If you do wish to surface from your private oasis, however, you can unwind in the stone and timber farmhouse, which features an open fireplace and cosy lounges to snuggle into together. The on-site spa features bathing suites and large stone baths, as well as a steam room and rainforest shower suites. For the vino lovers, you’ll be pleased to know the accommodation is nestled among five hectares of vines belonging to the EMPIRE Estate Vineyard – so unsurprisingly, the wine available during your stay is on point. Prices start from $295 per night for a loft suite, including continental breakfast. Longitude 131, Uluru. Photo courtesy of Tourism NT. When asked to picture a romantic getaway, most people probably wouldn’t envision a night spent out in the desert alongside Uluru. However an experience among the bright red dirt of this magnificent rock, soaking in your private tub, taking in the breadth of this national wonder – could be the most romantic thing you ever do. While not embracing winter in the rugged-up cold sense, it is a slightly cooler time of year to visit Uluru, and those who don’t deal with humidity well will prosper from a winter visit. Your accommodation includes food prepared by executive chef Jonathan Bryant and his team, as well as premium wines and spirits. Sunset drinks and canapes are also served in the cool of the early evening out on the deck. Prices start at $1500 per person per night, all inclusive.